A 3¼ mile circular walk from Deptford Bridge DLR Station. St John's mainline station is on the route. There is some overlap with a Deptford walk. The gin distillery on the left operated between the 1770s and 1970s as firstly Goodhews, then Hollands and later Seagers. To the left of the original central building a former storage warehouse for Peppercorns was utilised by the distillery. On the corners are an old shop (once a cafe) and a former Westminster Bank. Further along is St John's mission hall and the Deptford (once Tideway) Telephone Exchange of 1934-5. Numbers 27 - 31 built in 1728-30 are rare survivors of three roomed timber-framed houses. Wellbeloved Butchers is an old established business. The new shops set back on the left replaced the Broadway Theatre designed by WGR Sprague in 1897 and built on the site of a corn and seed warehouse at 'Agars Corner'. It was used as a cinema 1916-1963. Further along on the left is Addey & Stanhope School built to replace two charity schools in 1899 but since extended. Opposite was the New Cross Empire (1899-1954/8). The Iyengar Yoga Institute occupies the former premises of the New Cross Building Society (re-built interwar). Next door is the Zion Baptist Chapel with a facade of 1876. Beyond Thornville Street some cottages of the 1840s remain but much of the area was bombed in WWII. Kylefield House at number 124 was a mansion of 1789, originally called Brunswick House, with gardens stretching to Lewisham Way. The end wall has a Coade Stone medallion. It served as a school for much of the 19th century but by 1925 was a lodging house. Further along former shops have been converted to houses. Only the corner premises (1935) remain from Pynes department store which previously had a frontage as far as Alexandra Cottages. This is now only the entrance to commercial premises but there were formerly 12 two storey houses. The former Deptford Library (a Carnegie gift) was designed by Sir Alfred Brumwell Thomas in 1914. Detour into Rokeby Road to view some unusual houses of 1934 with a roughcast finish. The war memorial was erected in 1921. The site of Brockley Congregational Church was redeveloped in 1968 but the boundary wall remains. Return towards the main road and enter the Memorial Gardens via the slip road then walk through. These were private gardens for the residents of Wickham Terrace behind. Original houses (1849-55) remain in the section between Manor Avenue and Wickham Road. Opposite on the corner of Friendly Street is a former (Barclays) Bank of 1886. The gardens were purchased by Deptford Council in 1924 (see board at far end). 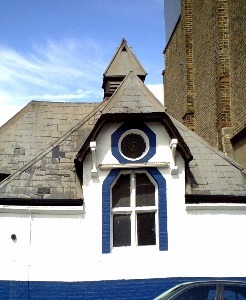 The Tressillian Building (formerly SELTEC) was built in 1931 and has coats of arms of the LCC and Borough of Deptford. On the left is Stone House built by George Gibson for himself in 1771-73. St Johns Church was designed by Philip Charles Hardwick in 1854. Beyond this is the Presbyterian Church of Wales (1924). The adjoining vicarage was built in 1823 for Jonathan Lucas and served St Johns Church 1854-1924. Across the railway bridge the former Lewisham Road Station of 1871 is used by a salvage company. Beyond this numbers 62-70 of the 1850s were built by Alfred Cross who occupied the (curious!) corner house (Beaufort Lodge). There are fine houses of 1860 (also by Cross). Number 17 has a plaque to Cecil Hepworth, film pioneer. Return to the main road (Loampit Hill) and retrace your steps to St Johns Church. Go right into St Johns Vale and first right into Cliff Terrace. There are large houses of the 1860s. Return along Cliff Terrace. St Johns Station is situated to the right. From St Johns Vale go along Ashmead Road. At the end go right into Friendly Street. Some houses of 1806 remain on the east side. This has some attractive houses of the 1850s. Number 16 has a plaque to local historian Thankfull Sturdee. Left along Brookmill Road then bear left into Cranbrook Road. At the end go right into Friendly Street. The houses here were built in 1847. On the right was the Norfolk Brewery established in the 1830s and demolished for shops in 1909. Old properties opposite including the Golden Fleece pub and several lodging houses were replaced in 1902-3 by Carrington House and Sylva Cottages. On the ground floor of Carrington House were common rooms and on the five storeys above some 800 cubicles for homeless men. It was converted into flats in 1995 and renamed Mereton Mansions. Its railings are made from wartime stretcher frames. Noodle King was the Fountain pub dating back to c1700 but rebuilt in the late 19th century. At the main road go right to return to Deptford Bridge Station.